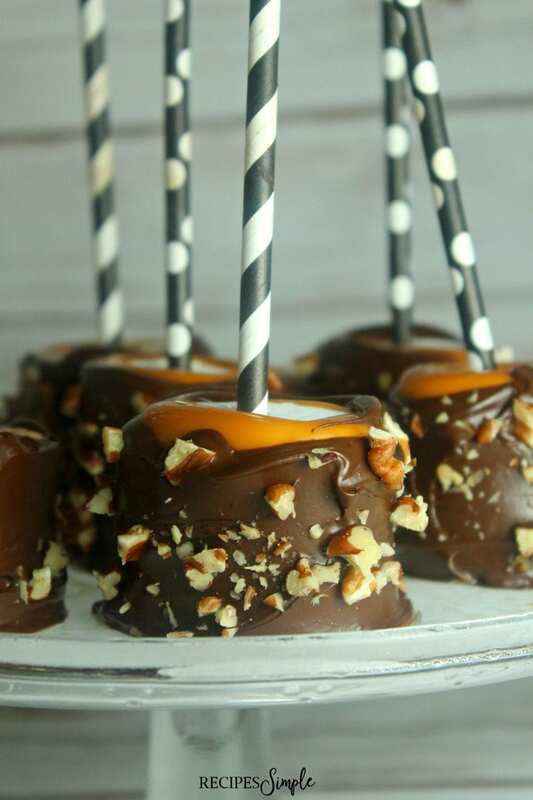 Jumbo marshmallows layered with creamy caramel and dark chocolate then sprinkled with pecans to make an easy delicious treat! These delicious treats are so easy and taste so good! They make great gifts wrapped in cellophane treat bags tied with ribbons. Give them to teachers, neighbors, co-workers, friends and family. 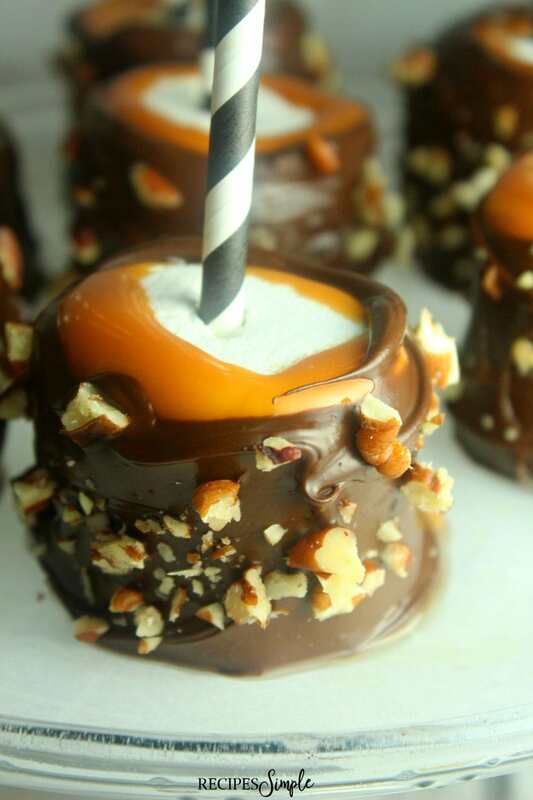 These Turtle Dipped Marshmallows are a huge hit at any kind of party, school event, birthday or holiday celebration. They are so fun and can be customized to any theme or holiday. 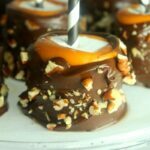 Scroll to bottom for printable Turtle Dipped Marshmallows recipe. 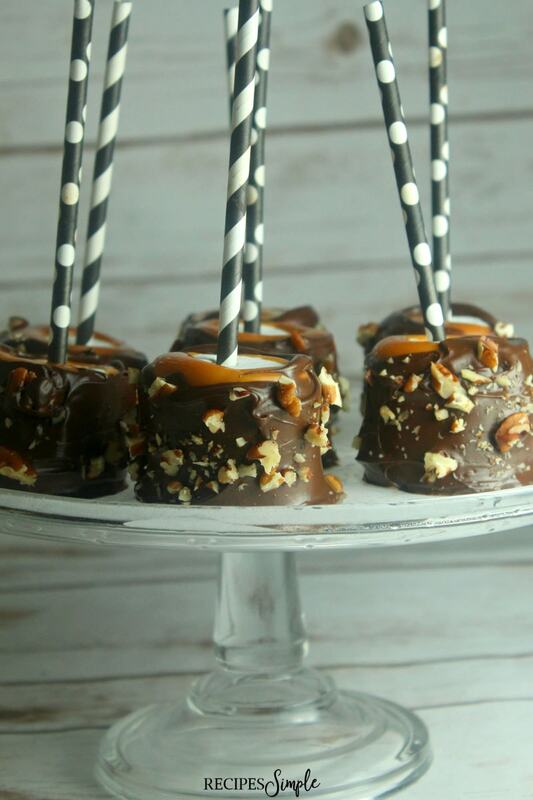 To make these delicious Turtle Dipped Marshmallows you will need jumbo marshmallows, Kraft caramels, dark chocolate candy melts, chopped pecans, and lollipop sticks. This really isn’t a recipe but more of a layering of ingredients. 1. Line a baking sheet with parchment paper. Place marshmallows on parchment paper and stick one lollipop stick into top of each one. 2. Next you will melt your Kraft caramels in a bowl according to the directions on the bag and let cool slightly. 3. Cover each marshmallow in caramel and let harden on the parchment paper. 4. While the caramel is hardening on the marshmallows, melt the dark chocolate Wilton’s candy melts in a bowl according to package directions. 5. 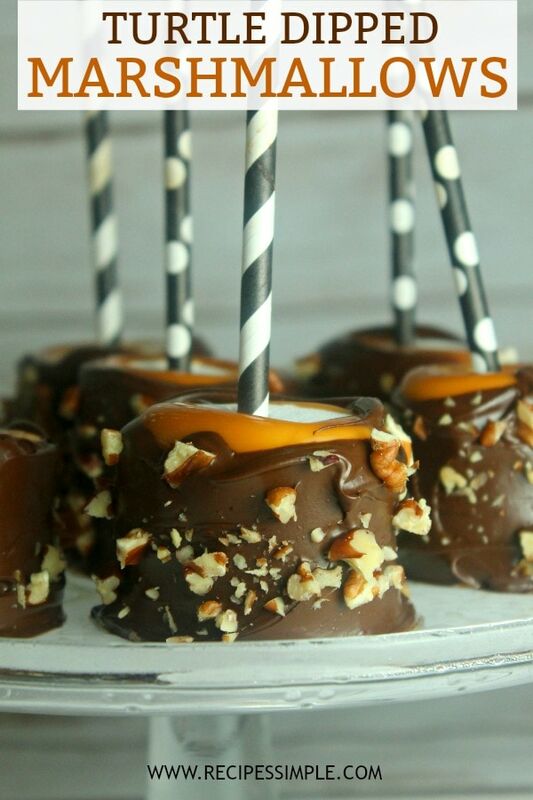 Dip each caramel marshmallow in chocolate. 6. Gently press or roll chopped pecans into the sides of the marshmallows before the chocolate hardens. 7. Set on parchment paper to harden. 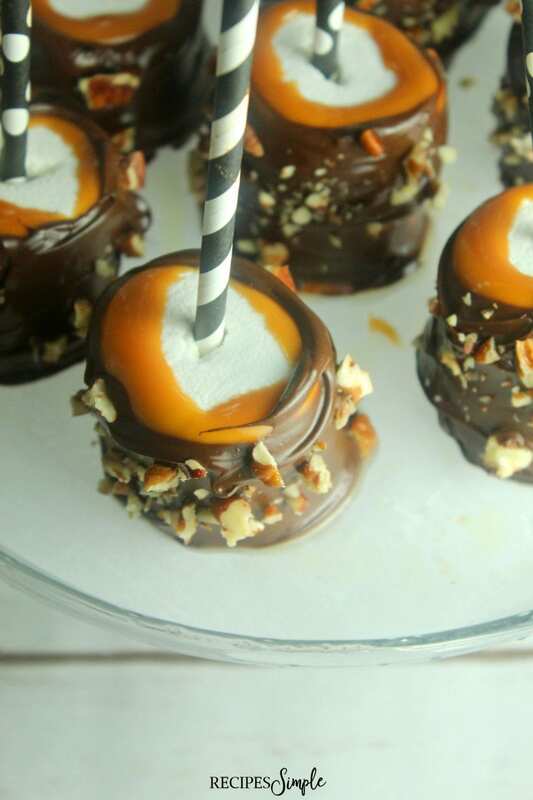 You may need to refrigerate dipped marshmallows for 20 to 30 minutes to firm up the marshmallow before decorating. If you don’t plan on serving them right away make sure you cover them so the marshmallows don’t get hard. There are so many different and creative flavor combinations you could do with jumbo marshmallows. You could use white chocolate, dark chocolate, milk chocolate. You could top with sprinkles, crushed pretzels, crushed Oreos or chocolate chip cookies, crushed nuts, fruit or candy. Rocky Road version – Dark chocolate and chopped almonds. S’mores Version – Chocolate and crushed graham crackers. Macaroon Version – Semi-sweet chocolate and coconut. Valentine’s Day Version – Dark chocolate and red hot candy pieces. Halloween Version – Semi-sweet chocolate and chopped pieces of candy corn. Christmas version – White or dark chocolate with crushed candy canes. Line a baking sheet with parchment paper. Place marshmallows on parchment paper and stick one lollipop stick into top of each one. In a bowl melt your caramel according to the package directions and let cool slightly. Cover each marshmallow in caramel and let harden on the parchment paper. In a bowl melt the dark chocolate Wilton’s candy melts according to package directions. 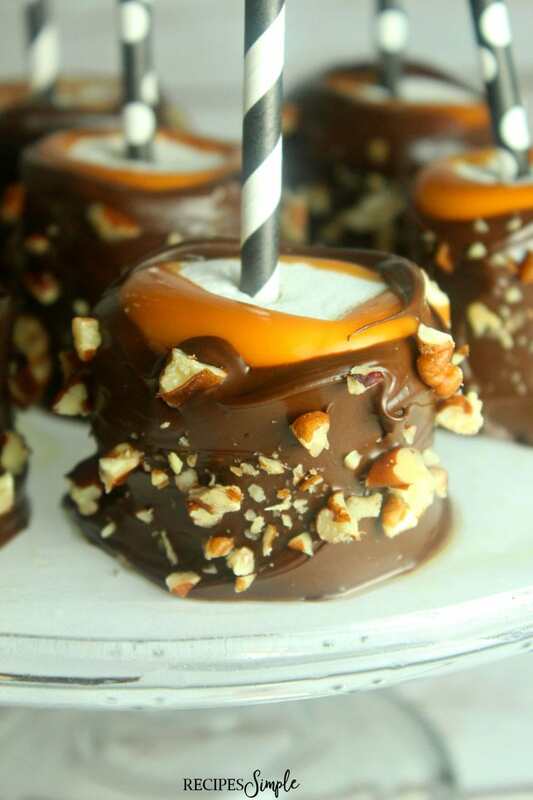 Dip each caramel marshmallow in chocolate. Gently press chopped pecans into the sides of the marshmallows before the chocolate hardens. You may need to refrigerate dipped marshmallows for 20 to 30 minutes to firm up the marshmallow before decorating. If you don't plan on serving them right away make sure you cover them so the marshmallows don’t get hard. Looks yummy and easy. Substitute these for cake walk at church for fall festival. I think the children will love them. These will be perfect for your church fall festival. I hope everyone enjoys them! These treats looked so delicious and beautiful, but I was unable to successfully make them. The caramel spread in a large pool around each marshmallow, unlike the ones in the photos. Also, I had only purchased one bag of Kraft caramels and found that it only covered 10 jumbo marshmallows. Please share your secret to getting neat treats. I dip the marshmallow when caramel is just warm and not when it’s hot right off the stove. I always let the caramel cool some before I dip. I have found that depending on the brand of marshmallows you buy some of the jumbo are larger than others, so one bag of caramels may not cover depending on size. Hope this helps!